Bronze Records is an independent English record label set up in 1971 by record producer Gerry Bron, and based in Chalk Farm, London. 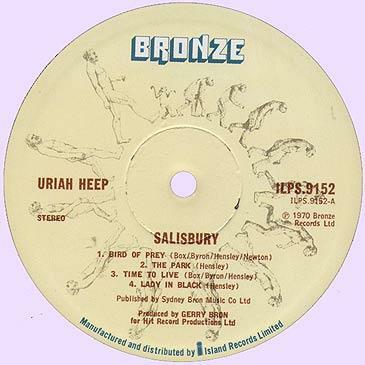 Bron had been producing Uriah Heep for Vertigo Records, and he set up this new label for future Uriah Heep releases, along with Juicy Lucy, Richard Barnes and Colosseum. Other subsequent acts included Osibisa, Paladin, Goldie, Manfred Mann's Earth Band (another Vertigo refugee), The Real Kids, Sally Oldfield, Motörhead, The Damned, Girlschool, Bronz and Hawkwind. Original manufacturing and distribution was through Island Records, moving to EMI in 1977 and then onto Polydor Records in 1980. The label folded in financial difficulty in 1986, with the catalogue being sold to Ray Richards' Legacy Records. It subsequently passed to Castle Communications plc.